Please note: Healing herbs are not meant to be medicinal, and that you must be careful that any plant you ingest is safe for you and your family. Chamomile is known by almost everyone for it’s ability to ease us into sleep, when steeped into a tea. It also is used for stomach upset. Dry the flowers for long term storage in ziploc bags, or use them fresh steeped into a tea. This is a gentle herb that can be used for children as well. 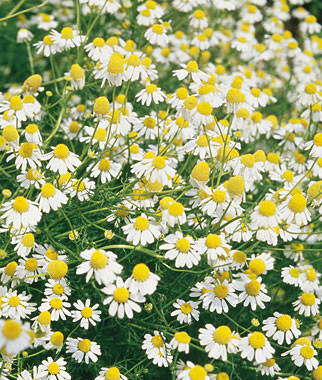 The best variety to grow, and the most commonly used for tea is German Chamomile. This is an annual that grows into a bushy plant about 2 feet tall. It prefers well draining soil, full sun to part shade, and moderate water. Chamomile is easy to grow from seed. Feverfew (Tanacetum) has had some scientific studies done on it’s use for migraine headaches, with some positive results. Brewed into a tea, feverfew is best used as a preventative for migraines. 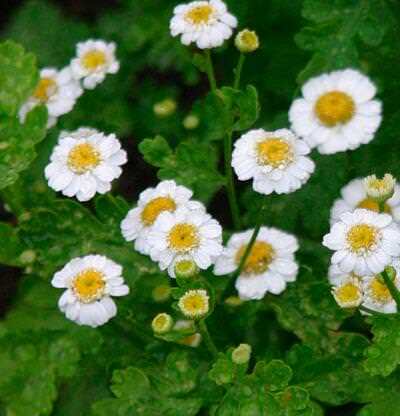 Grow Feverfew from seed, sprinkled onto the soil in early spring. Like Chamomile, it needs light to germinate, so don’t cover, just water in. Give it plenty of sun and you will be rewarded with hundreds of tiny button daisy flowers on a 20 inch bush. This is also an annual, but tends to self seed liberally. Also like Chamomile, brew flowers into a tea. Lavender is used to ease tension, and is generally used in aromatherapy… that is, the scent is used in oils and infusions. It is also edible, the flowers being used in salads or drinks, and can also be brewed into any tea. 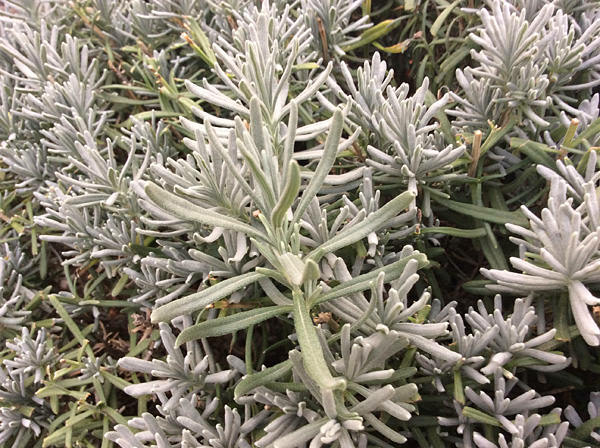 Easy to grow, lavender loves the sun, and is drought resistant. It does fine in poor soil, but the soil must be well drained. It will not tolerate heavy soil. 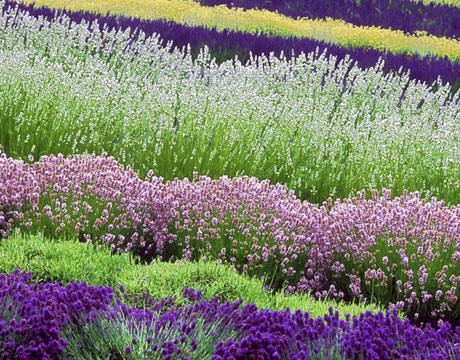 Several different types and colors are available , the most common is English Lavender, but French Lavender and Spanish Lavender are popular as well, although less hardy. The varieties bloom at slightly different times, but usually from later spring through mid summer, with another short flush in the fall. A short lived perennial, it will come back for several years, but will then tend to die back, stating in the center of the plant. Luckily, you will find many volunteers popping up ready to take it’s place. Did we mention, it’s gorgeous as well? Peppermint is one of the tummy trouble remedies I actually use, and so do my kids… It really does help relieve nausea and even stomach cramps. It can be energizing as well. 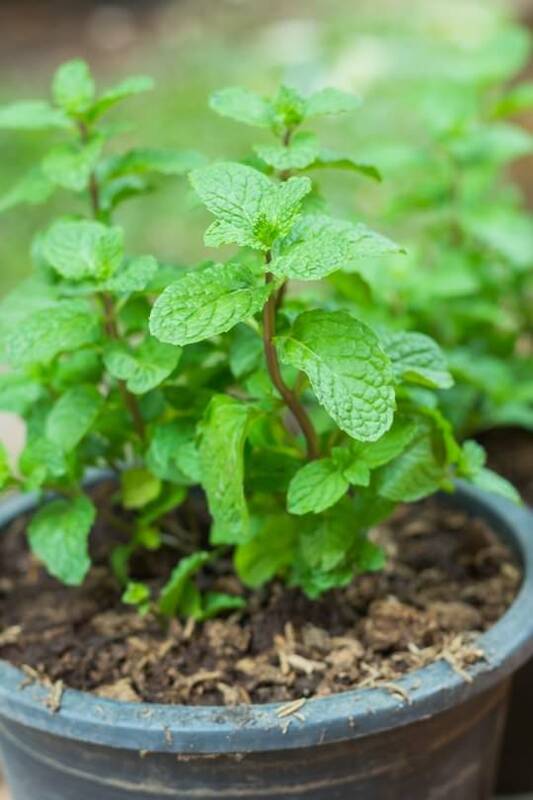 Peppermint is an aggressive plant that can take over a garden if you let it! Although I love growing any kind of mint, if you don’t want to be pulling it like a weed, plant it in pots. Prefers afternoon shade in hot areas, can tolerate some shade in any area. Perennial that comes back every year. Grows best in fertile, moist soil. Flowers are not showy. Foliage is aromatic, and leaves are edible in salads, sauces and can even be frozen in ice cubes to refresh cold drinks. 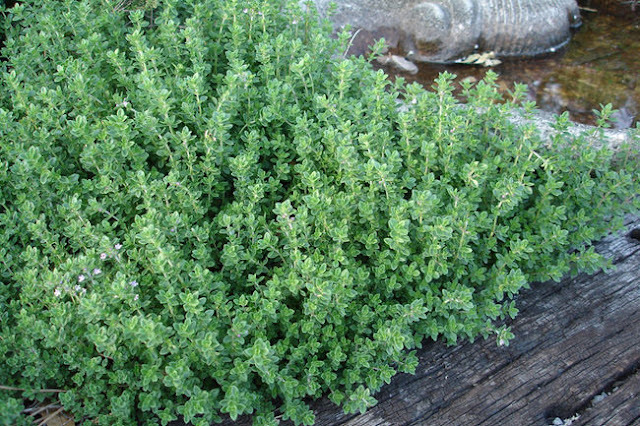 Thyme is a powerful antiseptic and astringent. Used for coughs and sore throats, it is gargled with or made into a tea, usually in combination with other herbs. Also used as a disinfectant spray. Thyme is an herb that has become popular with several decorative varieties in the last few years, including one of my favorites, ‘Doone Valley Thyme’ with its pink flowers. Flowers are tiny but plentiful, and the plant loves sun and tolerates drought. Varieties exist from the low growing ‘creeping Thyme’, to the parent variety, common thyme. Common thyme has been said to have the highest level of Thymol, or oils. A semi woody shrub, it is useful in the garden as well as the kitchen. Easy plant to grow. Garlic is one of those herbs that continues to prove it’s health benefits. Long known for it’s cardiovascular health benefits, it is also used as an anti viral and anti fungal… In my opinion, the best way to take advantage of the healing powers of garlic is to cook with it! Garlic is easy to grow, especially if you already grow vegetables. Each clove from a garlic bulb will grow into it’s own bulb, and yes, you can plant from grocery store garlic. Simply soak them in a jar of water with a tablespoon of baking soda before planting, to prevent fungal diseases. 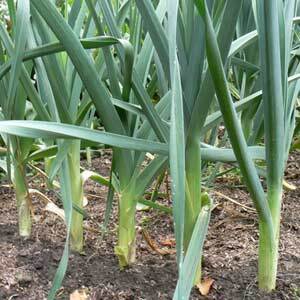 Plant garlic in fall, and allow to overwinter. In June or July, when the green stalks are 3/4 brown, gently dig up bulbs and tie together several bunches, then hang to dry. Store in a dry, cool place. Make really good pasta! Lemon Balm is used in a tea for anxiety. Just pick the leaves as desired and brew. 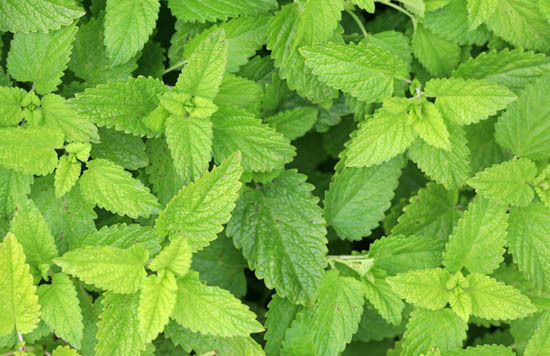 Grow lemon balm in partly shady area for best results. Rich, moist soil will give you the best plants with the highest amount of oils in the leaves. Being a tender perennial, it will not survive any but the modest winters. Lastly, we have parsley. More than a garnish at the side of the plate, parsley helps cleanse the liver, flush the system of excess water and soothes the stomach. 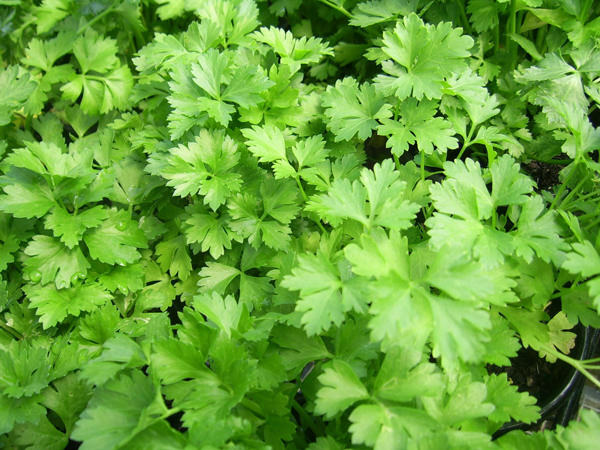 Parsley prefers part shade and rich soil, and does well grown indoors in a sunny windowsill. I prefer to grow the flat leaved variety. Give afternoon shade in hot areas. Harvest by cuttings leaves as needed.